hah, this is totally me. Every single conversation. A planet. Of mole meat. This is genius, this is amazing. Best what-if yet. I think this comic gets the award for weirdest comic yet. Last Sunday, floating around vivid blues and florescent yellows, was the bald spot on my father's bald head. BrianB wrote: Hey everybody - THE CAR IS ON FIRE! Now shut up about your petty discussion of digital vs chemical photography. I think this comic is about how stupid "future predictions" that scientists make are, and that they're assuming too much. 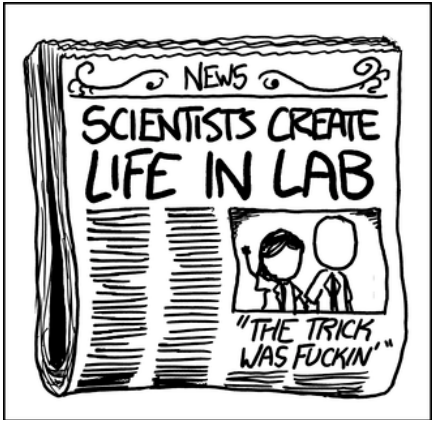 If you start from the wikipedia article on XKCD, you get into a loop. How ironic. My school computer password is now "correcthorsebatterystaple"
I was expecting something... you know... bigger. But not bad nonetheless.